As a sous vider, sooner or later you will run across the "floating bag challenge". Specifically, this is when the sous vide bag in the water bath begins to float, exposing a portion of the contents above the water level. There are several things that can cause this floating, with the most common being an excess of air in the bag. Another cause is by buoyant food such a several types of vegetables or frozen proteins such as chicken. There are a number of ways to Prevent Sous Vide Bags From Floating. One of the more popular solutions is the use of magnets. In this article I will be focused specifically on the use of Disc Neodymium magnets. A Funny Story with a Lesson! As I mentioned above, I received my Disc Neodymium magnets as a Christmas gift. The magnets come in a stack, separated by plastic washers as shown in the picture above. Once I opened the package, I briefly played around with the magnets and could tell they were quite "strong". Next, I passed the stack of magnets on to Martin, Jason's father-in-law, so he could examine them. That's when it happened! Martin doesn't remember exactly what he was doing, but all of a sudden,one of the magnets literally flew from the stack and hit him in the glasses! That's when I realized, these were not the ceramic magnets I played with as a child. When marketers say, "Neodymium magnets are the most powerful permanent magnets in the world", they are not exaggerating! If you are not careful, you can actually injure yourself with these magnets - so beware. When reading on the CMS Magnetics website, they warned, "Do not let your children under the age of 10 play with Neodymium magnets larger than 1" in diameter. They will get pinched." Interestingly, they went on to say, "Do not place these magnets into orifices of the body." Trust me, I really don't think they needed to warn us about that one! In this section I will provide a little background on neodymium magnets in general. They are a member of the Rare Earth magnet family and are also referred to as NdFeB magnets, or NIB, because they are composed mainly of Neodymium (Nd), Iron (Fe) and Boron (B). Surprisingly, they are a relatively new invention, invented in the 1980s, and have only recently become affordable for everyday use. You can find neodymium magnets in action today in a wide variety of applications including: refrigerator magnets, ear buds, cell phones, iPads, high-end speaker systems, toys and hybrid cars. Neodymium magnets are graded by the material they are made of - example grades include: N35, N38, N38SH and N52. The higher the number following the "N", the stronger the magnet. The strongest neodymium magnet available is N52. It's also important to remember that, in addition to being stronger, the higher number magnets are also more brittle. If there is a letter following the number, it refers to the temperature rating of the magnet. The temperature ratings are "stardard" (has no letter after), M, H, SH, UH, and EH. Since there is iron in the magnet, if exposed to the elements, the magnet will rust. Therefore, you will typically see the magnet covered with a variety of different types of coatings such as: zinc, copper, tin, epoxy, silver and gold. Most of the magnets I have seen are "triple plated" with layers of nickel, copper, and nickel again. One of the coolest things about neodymium magnets, is they don't lose their magnetization like other types of magnets. In fact, they lose less than 1% of their strength every century. However, they will begin to lose some strength if they are heated above their maximum operating temperature. This is super important for sous viders since this temperature is 176°F (80°C) for the standard N grades. That means if you have the magnet in the water bath and you are doing something like vegetables, the temperature is going to be greater than 180°F (82°C). As Martin discovered in my introductory story, neodymium magnets are between 7 and 14 times stronger than the strongest ceramic magnets. But what exactly is "strength", when you are referring it to a magnet? There are numerous ways to measure the "strength" of a magnet. Gauss and Maximum Energy Product are more scientific terms. I'm going to use "Pulling Force", which is much more intuitive and easier to understand. In simple terms, it is the force to separate the magnet from a steel plate, when perpendicular to the surface. For example, the amount of force it would take to pull a refrigerator magnet directly off the surface of the refrigerator. The material the magnet is made of: For example, a neodymium magnet is stronger than a ceramic magnet. 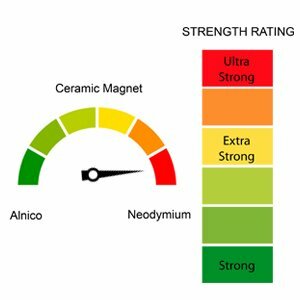 Moreover, a neodymium magnet constructed from material with the grade of N52 is stronger than one graded N42. The thickness of the magnet: Typically the Pulling Force is proportional to the thickness of the magnet. The area of the magnet touching the surface: Similar to the thickness, the Pulling Force is proportional to the area contacting the surface. The bottom line is quite straightforward: the larger the disc diameter, the greater the disc thickness, and the higher the grade; the more powerful the magnet will be. If you are a senior like me, please keep in mind that these are not the ceramic magnets you may have played around with as a kid. These neodymium magnets are typically 10 times more powerful than the old ceramic type. This makes them much more useful, but also slightly more difficult to store and handle. In this section I'll talk a little bit about storing and handling these magnets. 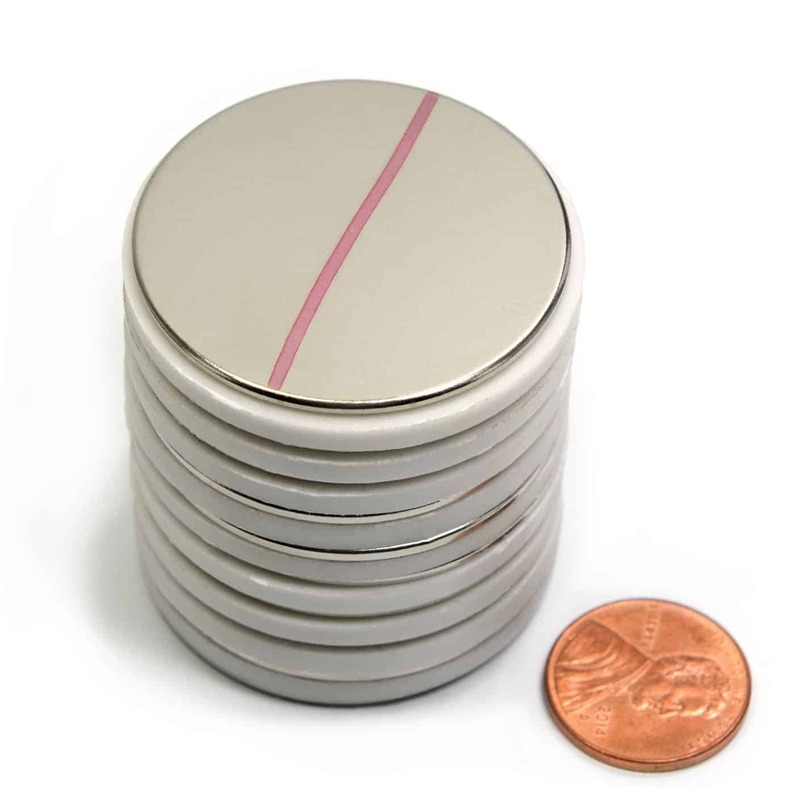 When purchasing disc neodymium magnets, they typically come in a stack, each separated by plastic washers approximately 1/8" (3.2mm) thick. This keeps the magnets from "sticking" together. It is also relatively easy to slide one magnet off when you're ready to use it. Unfortunately, it normally takes both hands in order to extract one of the discs from the stack. Often it seems like I've got something in one hand when I'm trying to do this, which makes it quite difficult. That's why I have chose to store my magnets in a different fashion, describe next. To make it much easier to quickly grab a neodymium magnet with one hand, I have put an old metal block to work "holding" a number of the discs. As you can see in the video, it is quite easy to extract a disc from the block using just one hand. If you don't have a metal block handy you might try looking for some other type of metal strip that would act in a similar way. As an example, I put a large kitchen tong to work in the same way. No matter how careful you are in handling the disc neodymium magnets, they are going to end up getting "stuck" to one another at some point. Depending on the strength of the two magnets, it can be somewhat challenging to separate them again. The key to separating two magnets is to focus on "sliding" them apart. Even this can be challenging if the magnets are strong. It is also difficult to try and slide them apart if your hands, or the magnets, are either greasy or wet, which they often are. I have discovered a better way to slide the magnets apart. I have found that using a Jar Gripper Pad makes it really easy to slide the discs apart. The one used in the video I got for free from a local political candidate. It cleverly had the following message printed on one side, "Let's Get A Grip On Spending ~ Vote Row A"! The primary use for disc neodymium magnets in sous vide cooking is to meet the floating bag challenge mentioned earlier. When using a polycarbonate container for a water bath, two disc magnets are typically used. One is placed on the outside of the container, and the second is used to "pin" the sous vide bag to the side of the container by lining up the two disc magnets. In the video below you can see how this is done for both the asparagus and frozen chicken. Often when inserting the bag into the water bath, especially with vegetables, the water temperature is quite high, so you don't want to get your fingers into the water. That's why it's best to start by pinning the bag out of the water and then sliding the pair of magnets down the side of the container, using some sort of tool to push the bag down as well. I have also discovered that there is a bit of a learning curve associated with where you place the magnets on the bag. For example, the first time we did the asparagus, we placed the magnets at the top of the bag. However, when the magnets were pushed all the way to the bottom of the water bath, the bag went vertical and the "bottom" of the bag floated to the top and came out of the water. That is when we switched to placing the magnets on the side of the bag ,which worked much better. A method used less often is to slide one of the magnets underneath the water bath container, and then pin the bag to the bottom of the container by putting the second magnet on top of the bag. Some of you may be using a metal pot as your sous vide water bath container. In many cases you can pin the bag to the side of the container just using a single magnet. However, it is surprising how often the sides of a metal pot are not magnetic, in which case you are out a luck. Finally, let me share something I learned the hard way. When sous viding vegetables, the water temperature is typically above 180°F (82°C). Because of this, the outside of the water bath container, as well as both of the disc magnets, are extremely hot. Therefore, when removing the bag from the bath, do not try to slide the magnet on the outside of the container using your bare hand. It will burn your fingertips, and they will be sensitive for the next week. You've been warned! In my opinion one of the greatest advantages of neodymium magnets is that they are used external to the sous vide bag, rather than internal. Some solutions require putting some sort of "heavy" item in the bag in order to weigh it down. Regardless of what an item is made of or covered with, I get a little nervous with it being in the bag contacting the food. Perhaps this is just me? Disc neodymium magnets take very little room in your sous vide water bath, unlike some ad hoc type solutions. It is quite easy to fit in at least two bags on each of three sides of the container. This will work well for most families. Similarly, the magnets themselves don't take up much storage space in your kitchen drawers. As the classic proverb says, "There's more than one way to skin a cat." Similarly, there are numerous ways to use disc magnets to overcome the floating bag challenge. I have mentioned only two in this section, but there are many. On some occasions I have had to use two pairs of magnets on larger sous vide bags. Other times I have had success by clamping two bags together using a magnet pair. With magnets it seems like there is nearly an unlimited number of solutions that you can try. Occasionally you will hear the argument that since the bag is "pinned" to the side of the water bath container, that the contents do not get cooked evenly. Although a portion of the bag is "pinned" to the side of the container, in my experience, the remainder of the bag is usually floating free, allowing plenty of circulation. If this is a concern, you can try pinning the bag to the base of the container, which typically provides better circulation..
Clearly, in order for disc neodymium magnets to effectively keep bags from floating, the magnets need to be strong enough to attract each other and thus "pin" the sous vide bag to the side of the water bath. Unfortunately, these neodymium discs do lose some of their strength when subjected to temperatures greater than 176°F (80°C). Therefore, if you do sous vide items above this temperature quite often, you will see the strength of your magnets diminish over time. I do have two suggestions to help ameliorate this potential downside. You may want to reserve a couple of magnets for use at high temperatures so that all of your discs are not impacted. If a few of your magnets have lost some of their strength, and you're having trouble "pinning" the sous vide bags to the side, you may want to try the following. Rather than just putting one disc on the inside and one on the outside, you can double up the discs on each side. Each pair will then be more powerful than a single disc and probably provide the strength you need. As I have alluded to numerous places throughout this review, because of the surprising strength of these disc neodymium magnets, you do need to be cognizant of potential safety issues. The magnets I have been using are the CMS Magnetics N45 1.5" x 1/16" Disc Neodymium Magnets. Since these are made from an N45 material and are only 1/16" thick, they are relatively weak compared to others that are available. They have a Pulling Force of approximately 8 pounds..
CMS Magnetics has some stronger 1.26" x 1/8" Super Disc Neodymium magnets as well. Their diameter is smaller, but they are made of an N52 material and are twice as thick as the ones I've been using. They have a Pulling Force of 17 pounds, twice that of mine. With these stronger disc neodymium magnets, you really need to be careful. If you doubt this, you may want to scan the reviews on Amazon, where you can see how they can easily pinch you and draw blood (See photo). The other thing to note about the stronger N52 disc neodymium magnets is that the material is more brittle and the discs are prone to breaking if handled too roughly. Having used these disc neodymium magnets for about three months, they have become my "go to" solution for the floating bag challenge. They do not always work, but I typically try to use them first. They are relatively inexpensive, flexible and easy to use, and do not take up much room either in the bath or when stored. They are also kinda fun to play with on occasion, but you do need to respect their strength so you don't injure yourself or others! I would definitely recommend that you might want to include a set of these disc neodymium magnets in your sous vide "toolbox" as one viable solution to the floating bag challenge. If these Disc Neodymium Magnets sounds like something you would like, you can get them on Amazon. If you have experience with Disc Neodymium Magnets used for sous vide, I would appreciate you sharing it in the comments below. Thanks.